While I was on break from work I missed a phone call, "Tall Mom (not really) this is the Boston Athletic association you failed to put the expiration date of your credit card on your application, please call us with that information so we can complete your registration." HMMMMM, what is this? A sign that maybe I shouldn't do it? It was my OUT, my chance to give up on Marathons, on my dream, my chance to slither back into my depression, no one would judge me if I took the EASY way out. This is to notify you that your entry into the 115th Boston Marathon on Monday, April 18, 2011 has been accepted. Yesterday was my first training run for Boston. Less than 15 weeks until a dream is realized!! See my new ticker on the right sidebar? Was my first training run easy? HECK NO!! I am 10 pounds heavy, far from the shape I was in on May 2nd. I am new to the treadmill thing and it was HOT!! I feel my weight when I run indoors, I need to get a fan, and I can't hear the TV (LOL). Since I am an RRCA Certified Running Coach and I NEED practice, I am creating my own training plan, fingers crossed to get it done ASAP. 5 miles done and a new journey has begun. No going back now!!! Speaking of Courage to Start.... My TM1000 (@) live.com inbox has 140 Emails!!! Wow that means that the Tall Mom 1,000+++ club has the potential to double in members for 2011.. Holy Wow!! Folks it is going to take me a few days to get you all logged in and reply to emails, please be patient. For the 2010 members the 2011 spreadsheet is up on the same link as last year see the tab at the bottom, please feel free to go in a log your miles. 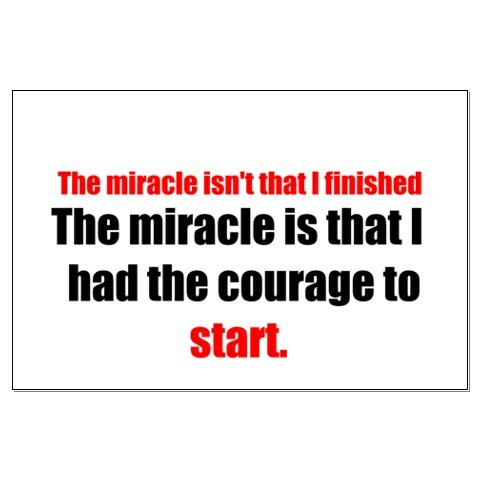 What do you need the COURAGE to start in 2011? What is keeping you from starting? Is there any way to remove barriers in your way? Or is it as simple as committing yourself to START? hizzah! i am so glad you will be here for this. Thank you for this post. I have the email in my in box to send to you to join the Tall Mom 1000+++, and was hesitating, not wanting to fail. I am going now to send that email!!! Congrats on starting! I can only imagine how difficult this all is for you, but we're here for you and I know it will be a once in a lifetime opportunity. I have that exact same quote as my signature for my email. I looked to that often last year as I was training for my marathon. I lost my Dad too and I was running the marathon for him, I though of that everytime I got sad and wanted to quit. I knew he would be proud and your Dad will be so proud of you too! Keep up the great work and keep that quote handy to reference whenever you need it. congrats on calling them back. this will hopefully give you something positive to look forward to. and your dad would want to see you cross that finish line. don't be too hard on yourself with where you're at with weight and food. you've been through so much. you will find your old self again and i think calling them back was the first step. see you april 18th!! LOVE, LOVE, LOVE this! So inspiring and I'm so excited for you to run Boston. Can't wait to cheer you on this journey! I am so sorry about your dad but I know he is going to be so proud of you once you cross that finish line in Boston. I can't wait to follow your training. Don't forget that you ran a 4:30 marathon last month with basically NO marathon training. That is incredible. YOU are an inspiration. Keep on running, smiling, and putting those miles in. Such a brave post! It's so inspiring that you took the leap and followed up with Boston. Thank you for your honesty. Your courage is inspiring. Can't wait to cheer you all on in Boston from Texas. I'm so glad that you decided to go forward with Boston. You really are an inspriation! That's a great quote! I'm doing my first marathon in May, so it'll be fun to watch your training. I'm doing it, but I definitely am needing courage to start mountain biking. The first time I tried it I fell and dislocated my thumb. Minor injury, major inconvenience and BILLS. I'm not a fan of falling and getting hurt (who is? ), and I know there's plenty of that in store for me. Right now I'm scared on the downhills, scared on the narrow sections, scared on the roots and rocks and trees across the trail...you get the picture. But I've got some clinics lined up and plenty of will to practice, and I know I'll keep it up despite my fear. I'm so happy to hear you're going to run Boston. Heck, even if you end up hobbling half of it, no one can take the attempt or the finish away from you. I went to college in Boston, right along the marathon route and I'd watch it every year. It was fun seeing the leaders go by but the most inspiring people to watch were always the people who were still running when the police came by to pick up the barriers and open the roads back up. They may have been behind, but they weren't going to give up. Your courage and positive outlook and STRONG MENTAL GAME are so inspiring and will no doubt help the runners you coach!!! Thanks for being awesome and sharing your adventures with the world. Be gentle to your knee!!! I have been out of marathons for a whole YEAR due to stress fractures and now tendonitis. Take care of you!! Good for you! !While it is not good that you have this internal struggle, it is good to know that those that have excelled as you have struggle also!! I have run 1 10K and am training for a 10M and a 1/2 M in April(3rd and 30 respectively) Good luck and you will do great at Boston! Congratulations on making the decision to go through with it! And thank you for sharing that experience. My dilemma- After signing up for my first marathon, I'm not sure if I should sign up for a second one 5 months later. I'm nost sure how I'm going to feel after the first one, so I'm reluctant to commit. As I get closer to the first one, I know I'll get my answer. I'm starting a running plan and sticking to it. I'm choosing to live each moment boldly. I will run my first 1/2 marathon this fall. I gave you all of these outs and you still want to do it?????? LOL.... you're going to rock! Good for you! I think you would have felt soooo much worse had you let the opportunity for Boston pass. I know you are channeling that competitive inner athlete! You are an inspiration to MANY readers and your journey will enlighten those of us that only dream about Boston. I need the courage to keep on strength training even when I am sore and hating it. Like right about now. You know I almost thought you weren't going to do it! (no judgment) It would have almost made me think you were human but then you went and did it. Mel, you are truly inspiring! You had a list of reasons to NOT and you chose to do it. I just love your drive. It is nice to know that there are other mom runners out there in the same boat. It isn't easy! But then if it was, it would probably lose its appeal. This year I'm a new mom (My son was born at the end of October.) and I am a new marathoner (Well training to be...). I registered for my first marathon which will be in November and part of me thinks I have lost my marbles and am looking for a way out but the other part has the courage and determination to give this challenge my all. Courage for each day...not just running. My heart goes out to you as you work through life without your Dad. Courage to try and begin is HUGE...don't put too much pressure on yourself...you are amazing right where you are TODAY! HUGS! Wow, great for you taking the more difficult path that you wont regret later. Is it weird to feel proud for someone you don't really know? I am trying to get the courage to put me first...even though it isn't always the popular decision with little ones! I CAN NOT WAIT to cheer you on in Boston!!! You are so courageous, Mel. Thanks for being such an inspiration to us all. I need the courage to not let seasonal depression get the best of me. I think it's awesome that you got the confirmation of Boston... I'm sure that the 'challenge' of it all will be a wonderful focus. You'll find strength that you might not have known you had. 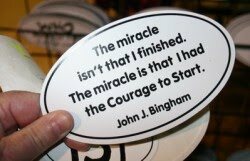 I'm trying to find the courage for my first 70.3 in June, and marathon redemption in May. Eeeeek.